We wish to proudly announce that in the latest tournament, which took place last weekend (28.03.2009) in Warsaw, the Poznan Hussars won first place beating out the guys from Warsaw and Wroclaw. Our march towards victory began with a high win against the Kosynierzy Wroclaw, who lost 3-10 in the first game of the tournament. 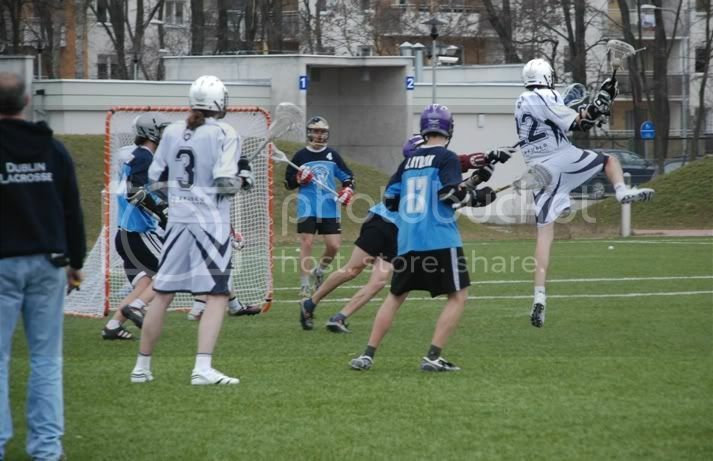 It was the first game of its kind in the history of Polish lacrosse where so many goals were scored by one team. After a short break we met Grom Warsaw on the field for the first time. We were pleasantly surprised at the playing level of the Warsaw crew; as a reminder they’ve been training only since September, which allowed them to score the first goal. Fortunately the rest of the game went along our terms and ended with the Hussars winning 6-2. The end of the tournament saw an equally interesting match-up with the Kosynierzy Wroclaw beating Grom Warsaw. It is worth to add that Pawel Hamrol, playing with number 22 for Poznań Hussars, scoring 7 goals was announced the best scorer of the tournament. The handing out of trophies and medals for the players finished everything off. As per tradition we all met later in a bar for the integration party. We thank the guys from Warsaw for organizing the tournament, the director of the Bemowo athletics facility for the trophies and medals, we also thank Christian Arnold for his visit to Poland and who refereed the whole tournament.